The hottest thing in vmworld 2011 was AppBlast. Scott Davis, VMware's CTO of end user computing demonstrated a new desktop and application virtualization solution, A project AppBlast. they have demonstrated the end computing solution using standardize HTML 5 compatible browser. We did not heard anything about AppBlast in 2012 from vmware and everyone was thinking that VMware has shutdown the project. VMware will not release the AppBlast as a product but as a integrated solution with other VMware product like VMware Horizon View. Its a technology that enables a remote application from any platform and deliver a rich user experience to any HTML 5 compatible browser. Wait... did i mean any Application? Yes any application any operating system! 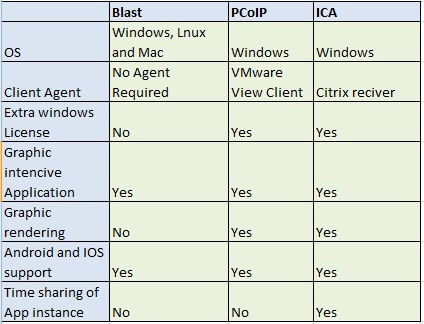 the blast protocol is capable of delivering Windows, Linux and Mac OS. Current version of blast is 1.0 and it works based on HTML 5. VMware is currently working on many innovations on top of HTML 5 to deliver batter, cheaper and robust solution. the protocol is designed to work in public, private and personal cloud. Wait.... What is personal cloud ? it means you can serve your application from home, office or any personal computer. e.g. you can access a bank application installed in your home personal computer from your iPad using blast protocol. its a one technology with multiple solutions. Blast protocol does not do any multimedia redirection to deliver graphic intensive application but instead it will remote Application interface developed in VMware project mascot. Currently blast protocol is in its infancy but i can see many opportunities for this protocol in future. 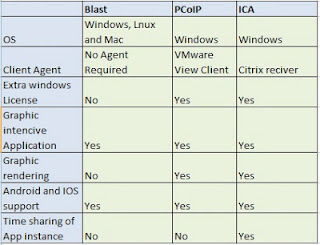 Does VMware has any plans to use the blast protocol for application Virtualization solution? VMware has already released blast with VMware Horizon View 5.2 . Blast uses the same technology in AppBlast which designed to deliver seamless applications from the datacenter via HTML5. we might see this as an Application virtualization solution in future.